Fish keeping is fascinating and fun with fewer responsibilities than almost any other pet. The bulk of your responsibility as a fish owner falls into the category of water care. Keep in mind the water you put in the fish’s aquarium is the human equivalent of the air you breathe. Just like breathing in air filled with pollution and smoke is unpleasant, water that is of unsuitable quality can make your fish sick, miserable and even kill them. Their quality of life is completely dependent on the quality of water in their tank, so there are some simple things you’ll need to do to give your fish a first class living environment. Weekly testing of PH levels in your water is extremely important to the well being of your fish. You should also have a master test kit to check readings of ammonia, nitrates and nitrites in the water. Don’t overfeed your fish as this pollutes the water quickly, only feed what they can eat within a few minutes and use a net to clean up leftovers until you get amounts of food sorted out. While having clean water is important, there are beneficial bacteria that work to clean waste from your fish out of the water and if you remove all the old water, clean all the decorations and substrate, you kill all these bacteria. So the trick in fish tank cleaning is to only partially clean the water to allow bacteria to continue to grow and thrive rather than starting from scratch with every tank cleaning. What’s nice about cleaning your fish tank is that you don’t actually have to take the fish out to do it, making the job that much easier. On a weekly basis, replace about a quarter or less of the water by siphoning it out of the tank, then replacing it with fresh water that has been allowed to sit for at least 24 hours to allow chlorine to evaporate or until it has been treated with a conditioner. Water left sitting for a week is ideal but 24 hours should be the minimum. This process is called conditioning or cycling your water. Remember that the fresh water needs to be the same temperature as what’s in your tank or you will shock the fish. While you are doing the partial water change, also clean a quarter of the gravel or substrate in your tank using a gravel vacuum. Only scrub off some of the decorations if they are getting mucky from too much algae and NEVER use any kind of soap or cleaning product on them, fish are highly sensitive to chemicals. In order for water to stay clean, filters need to be cleaned and maintained as well. However, pick a different time than during a water change to take care of your filters to lessen the impact on the tank bacteria and your fish. Rinsing out the water filters twice a month with clean tank water gets the gunk out without killing off the beneficial bacteria that make their home inside. While algae is a good sign that your water is in prime condition to support life, having your tank covered with it limits visibility, taking away one of the biggest joys of fish keeping in the first place. Keep algae growth under control by scrubbing algae off the sides of your tank before water changes, keeping filters clean and not allowing direct sunlight to hit the tank (which also makes temperature fluctuate) which creates an algae bloom. Having plant life inside an aquarium also fights algae growth as plants consume the same nutrients algae need to flourish. Any of these signs mean it's time to revamp your fish care methods a little so do some research into changing the environment of your tank. 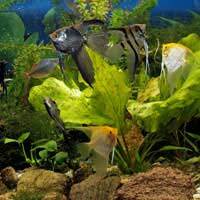 For more information about keeping fish as pets, why not visit www.tropicalfishexpert.co.uk. Child Friendly Pet For Epilepsy Sufferer? How Can I Stop My Dog Biting? Is There Anything I Can Legally Use to Protect My Dog? My Dog Was Attacked by Another - What Can I Do? Is Your Child Ready to Walk the Dog? What Suits Your Family Lifestyle? Which Toys For Which Pet?